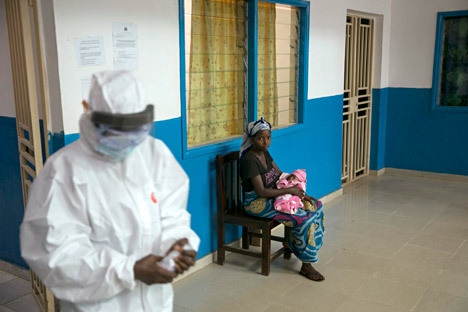 A health worker in the government hospital in Koidu, eastern Sierra Leone, December 20, 2014. Sierra Leone, neighbouring Guinea and Liberia are at the heart of the world's worst recorded outbreak of Ebola. In January 2016, Russian authorities announced a vaccine for the Ebola virus, which killed thousands of people in West Africa last year. Officials, however, did not go into detail about how it works or how in less than two years researchers managed to develop a unique drug that has no equivalent in the world. According to RBTH's sources, the new vaccine might in fact have been conceived to fight against biological weapons. The faded and unremarkable building that houses the Gamalei Scientific Research Institute of Epidemiology and Microbiology is located in a peripheral Moscow neighborhood. The Ebola epidemic hasn't hit Russia, so why does it need a vaccine? How were biologists able to develop this highly effective drug in just a year and a half? Russian officials declined to answer these questions, but virologists familiar with the vaccine told RBTH that Soviet-era military research provided for a foundation that helped scientists today to work quickly. In the USSR microbiologists studied the Ebola virus and other exotic diseases in the military town of Zagorsk-6, as well as in a Siberian research center, called Vektor. In the 1980s these studies were used to create biological weapons, and this research was the foundation used to make the vaccine that was presented in January. Professor Mikhail Schelkanov at the Far Eastern Federal University was among the first group of specialists sent to Guinea in the summer of 2014 to set up a microbiological center. He said that geopolitics is the primary reason for the vaccine's creation. "Nigeria, with its high population density, is close to the epidemic's epicenter; meanwhile, the Boko Harem terrorist organization is active in the country,'' Schelkanov told RBTH. "Essentially, this is the West African arm of the infamous Islamic State. If a biological weapon based on the Ebola virus falls into the hands of religious fanatics, the consequences for the world will be very serious. "The Gamalei Institute vaccine was created not only with the help of Soviet-era military research, but also with material that we collected in the past 18 months in Guinea," said Schelkanov. RBTH learned there is another vaccine in addition to the one created by the Gamalei Institute. This one was developed by the Vektor Novosibirsk Center for Virology and Biotechnology. RBTH inquired about Vektor's research with Anna Popova, the press secretary at Russia’s consumer rights watchdog, Rospotrebnadzor, and she confirmed that the vaccine has indeed been created and is now being clinically tested. A source who spoke anonymously said that the vaccine is effective, and that it was created based on another technology. "The vaccine was created based on a virus technology that has been mastered in Russia," explained one of its developers, Denis Logunov. "It's sometimes called the rose without thorns." It works like this: the antigen used to induce an immune response to Ebola or another dangerous virus is implanted into a harmless virus, which is then introduced into the human body. In addition to the main vaccine, scientists also created a version for people with HIV. Virologist Sergei Netesov, who in the mid 1990s tested vaccines against Hepatitis A, believes that since little information is available the vaccine in question has probably only passed the first phase of testing out of the necessary three. Clinical testing has already been done, according to the Gamalei Institute. "There were 92 volunteers, including understudies," noted virologist Yana Simakova, who directed the tests. She told RBTH that in laboratory conditions the vaccine demonstrated, "100 percent effectiveness." The institute promises to publish the data confirming this in the near future.